A few years ago, I had the pleasure of attending a party hosted by a local author, called the Winter Birthday Girl's Party. One of the people in attendance was the award-winning mystery author, Nancy Pickard. Until then, I wasn't familiar with Nancy or her books, but, as often happens, once I met her I started to read her work. In short order, I became a fan. Over the years I have read a number of her books, and, I remember being thoroughly impressed when I went to a local branch of a major book store chain and there was an entire section within the mystery genre dedicated to Nancy Pickard's books. I was particularly impressed since she hails from the Greater Kansas City area. It has been a while since I've gone looking for one of her books. Reading time has not been in abundance for me on any level. Time to read anything has become a real luxury. But, I had her book THE WHOLE TRUTH that I had purchased some time ago and recently completed it. I really enjoyed it, so thought I'd run out to the local book store and pick up another one of her "truth" books, since I was finally finding a little time to read. That's when I got a real shock. I went to the mystery section and began looking in the spot where there had been a Nancy Pickard area set aside. It wasn't there any longer. So, I'm thinking maybe they moved it, but search tho I may, I could not find her books set-aside. So, I began to search for them under the "P" section of mystery books. And, unbelievably, there weren't any there at all. Impossible, I think! She's written over a dozen mystery books, award-winning mystery books. So, I go ask. A very nice young bookseller takes a gander at their computer and assures me that no, they don't have any of Nancy's mystery books on site. They can order them in for me if I wish, but, with the exception of her newest (which is also an award-winner)they don't have any of her books in stock - period! Go figure? I don't know the whys or why fors of that decision by that local book store chain, but it just seemed so nonsensical to me! How can they not carry her whole range of mystery books in the mystery section? Anyway, I took a peek at Nancy's web site and she mentions a couple of local bookstore that I'm familiar with that do carry her works. When time permits, I will definitely venture over to one (or both) of them to pick up the books I'm wanting. One of these days, though, I hope the Country Club Plaza local of that major bookstore chain brings the Nancy Pickard mystery section back! Shelia Goss is celebrating a wonderful success this month with the publication of her newest book! PAIGE'S WEB is Shelia's third book, but it is her first that is being published traditionally without having been previously self-published. An engineer by education, Shelia was also blessed with a literary gift that she gave the same drive and tenacity she used to pursue her engineering degree. This resulted in two exceptional self-published novels, ROSES ARE THORNS, VIOLETS ARE TRUE, and MY INVISIBLE HUSBAND. With a fan base rapidly and soundly established, Shelia determined it was time to seek a traditional publishing relationship. With stats in hand she began her pursuit! Shelia is quick to tell you that the transtition from self-published to traditional was an often frustrating, heartbreaking venture, but when she did find a publishing home the results have been exceptional. Both of her first self-published titles were republished by her new publisher, Urban Soul, with resounding success and now, as mentioned earlier, comes the debut of this first, never before published effort, PAIGE'S WEB. We are wishing Shelia every success! PAIGE'S WEB is available everywhere books are sold! Green, Green and More Green! I found all these in my front yard earlier this week!I was actually taking a writing break and went out on the porch to enjoy the fresh air and decided to take a look around the yard. 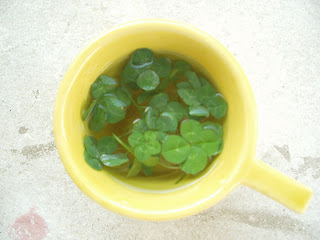 I'd found a couple of four-leaf clovers earlier in the summer and just thought I'd give it another glance, especially since we were about to start preparing the yard for next year and that would include putting down some chemicals that sometimes kill clover. 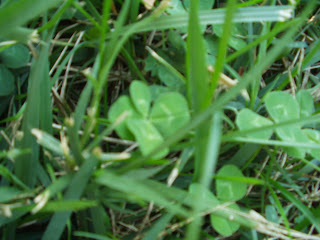 The first four-leaf clover just jumped out at me and from there, all over the yard, but not in patches, I found four-leaf, after four-leaf, after four-leaf! They were everywhere. The last two that I found actually had heart-shaped leaves, and, the most intriguing thing about those two was that although I attempted several times to take photos of them, the photographs would always be blurred or so infused with light you could barely make them out! Those I pressed and tucked away in my most cherished book... obviously they are special! Just thought I'd share! If these are by any chance truly lucky may you share in the wealth and good fortune!